There's sound checking and then there's sooooound checking until the crowd doesn't really care anymore. Oh, and with SXSW's tight scheduling every minute wasted beyond the 20 minutes after the previous band means you'll have on less minute to impress whomever you're trying to impress. 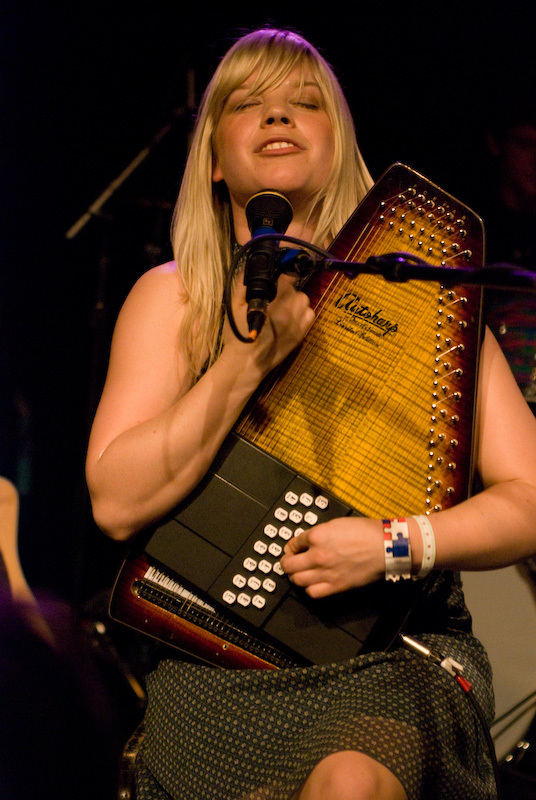 Basia Bulat and her band did their best to get their stage mix to a point where they could perform at their best. A combination of nerves, which several people standing near me noted, along with a stage crew that seemed to be having a hard time dealing with a band made up of autoharp, viola, and tenor 8 string uke. Ten minutes into her alloted time Basia gave up and came out to do an a capella number before the packed house (SXSW 2008 Buzz band Vampire weekend was performing here at 11:00). Her voice is beautiful and powerful. Serena Ryder, whom I'd also seen for the first time at SXSW 2007, immediately comes to mind. Then the comparison ends. Basia has also has a delightful delicacy to her voice and a delicous bluegrass vibrato. She, like Serena, is also a stunningly beautiful girl. Joined by by her band, and still soundchecking and bug fixing along the way, Basia's set was short but it hooked me and everyone else in the room. Like I did after experiencing Kimya Dawson the night before at the Body of War showcase I have vowed to search out and buy her music when I get home.